What Should I Do Without Official Identification? Home > Ask Our Experts > What Should I Do Without Official Identification? I have a serious dilema. I currently have no form of identification. I do not know how this happened but under my birth certificate I have my mother's maiden name, but my national insurance card is under the name I have been going by since I was a baby. The name is my mother's husband's name - he is not my father. I was never adopted by him and I am now having difficulty obtaining photocopied identification. I am struggling to get a job, driving licence or passport as you are required to provide proof of idenity which would be your birth certificate and national insurance card. Mine have two different names. Can you advise what I can do or who I should contact about this? Only you can decide which name you would prefer to use. This is a very personal issue, and you may want to give it some careful thought. It is quite legal to call yourself by any name you choose in the UK, so you have done nothing wrong by using your mother’s husband’s surname. However as it is not usually possible to change the name on your birth certificate (unless it is to your natural father’s name) if you decide you would like your passport, driving licence etc. to be in the name you have used all your life then you will need to officially change your name by deed poll. You can then produce the deed as a proof of identity. You can find guidance on how this process works on Her Majesty’s Court Service (HMCS) website. Alternatively, you may choose to take the name on your birth certificate. 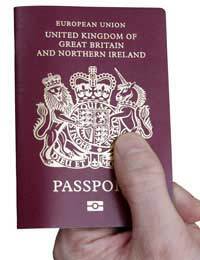 You do not need a National Insurance number for a passport, only a birth certificate. If you choose to take this name you can then update the details on your National Insurance Record. Contact the National Insurance Helpline for advice or you can also ask your local Department of Work & Pensions office or HM Customs & Revenue Office for help. It is also worth contacting each of the individual agencies to discuss your situation. For example you can contact the Passport Office telephone Adviceline, which is open 24 hours a day. Trained advisers can take you through exactly which documents you need to show them. Likewise the DVLA can advise on required documentation. Your situation is frustrating but by talking to the official bodies and following their procedures you should be able to apply for a passport and driving licence soon. Should We Report Our Stolen Birth Certificates? Social Networking: How Can I Protect Myself? What Information Needs to be on a CV? What Can I Do To Prevent Mistaken Identity? How Do We Check a Credit Report is not Duplicated?